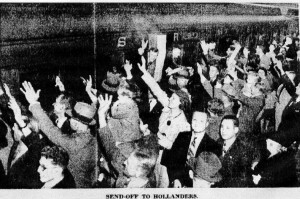 The image shows the scene at Johannesburg Park station on or around 22 May 1940 when the first group of KNIL volunteers from South Africa set out for the Netherlands East Indies. These were all expatriate Dutch citizens that had immigrated to South Africa in the preceding ten years from a fatherland wracked by economic hardship . This generation had grown up with the firm conviction that entanglement in wars could be avoided by a policy of strict neutrality. The news of 10 May 1940 that the German army had trampled Dutch neutrality underfoot, was greeted with consternation. Among many young men this prompted a patriotic response directed at Dutch embassies: they would return home to join the Netherlands army in order to evict the invaders. With the Dutch capitulation a week later, the situation had suddenly become more complex. The Dutch government, that is to say, Queen Wilhelmina and her cabinet, now living in exile, sought to marshall whatever resources were available to secure the early liberation of Holland. A key element was the Netherlands overseas empire, fabulously well-endowed with strategic raw resources such as oil, tin, bauxite, rubber quinine, cotton, rice and sugar. In addition it had a huge manpower supply, albeit mainly Asian, and the not inconsiderable Dutch Navy stationed in Java. In addition its colonial, army (the KNIL) was still intact. A second potential resource was the considerable Dutch immigrant population that had demonstrated such unwonted enthusiasm for military service in order to liberate the fatherland. These overseas citizens were now encouraged to form volunteer military brigades in England and in Canada, two countries that had become de facto Dutch allies and cautiously offered help but where training facilities were unavailable as yet. My family departed on 26 May 1940 on the cargo ship m.v. Straat Soenda from Durban in the company of seventeen other volunteers. All told a little under three hundred volunteers embarked during the last week of May and the first two weeks of June, 1940 for the two week sea journey to Batavia, the colonial capital of the NEI . This was perhaps only 5-10% of the available manpower potential. This movement of military personnel did not go unnoticed by Japan, and stirred up diplomatic controversy while at the same time straining relations between the Colonial administration and the Netherlands Government-in-exile. The impression was quickly gained that the map of Europe had been permanently altered by Hitler and that England might even be invaded. This reduced the enthusiasm for military service and caused the Dutch Government-in-exile to bring pressure to bear on its citizens. The idea of conscription was floated, but was turned down by the Canadian and American governments. The former had bitter memories of its own conscription crisis during the first World War while the United States was nominally neutral. In South Africa the Dutch Government’s policy however found fertile ground, because in this country a simmering domestic political dispute had found congruence with the emerging disaster facing Britain. The South African Government , under General Smuts declared its willingness to use its judicial powers to implement conscription for Dutch citizens, should the response fail to meet expectations. At least one person got incarcerated. That the South African Government would not and could not consider a conscription policy for its own citizens was left unchallenged. All told a little under three hundred volunteers embarked during the last week of May and the first two weeks of June, 1940 for the two week sea journey to Batavia, the colonial capital of the NEI . This was perhaps only 5-10% of the available manpower potential. This movement of military personnel did not go unnoticed by Japan, and stirred up diplomatic controversy while at the same time straining relations between the Colonial administration and the Netherlands Government-in-exile. By July, 1940 this recruitment campaign was all but forgotten (except for those lingering in South African prisons). For more information and source material read :Tjideng Reunion. 2 Responses to "KNIL Volunteers from South Africa"